Hello and Happy Tuesday! Hope your week is off to a terrific start! I was in a craft fair weekend and made a little money so I bought more stamps! lol Speaking of buying new stamps, I recently bought the awesome Hero Arts Vintage Post Stamp and Die Set from Justin at Stamp, Ink, Paper Store. So since this week is Card Maker's Choice, I decided to use my new set! Before I get to my card, here is the Banner for this week's post. 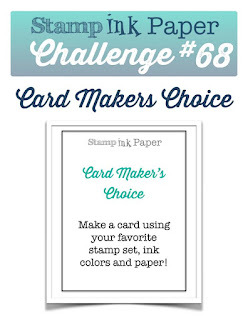 I hope you'll head over to the Stamp, Ink, Paper Challenge Blog and link up a new card of your choice! So here is my card, it was a little difficult to photograph because it is a Fold Back card. Here is another picture that shows it as it opens up.. I scored my 5 1/2 " 8 1/2" Garden Green Cardstock base, at 2 - 3/4" and 4 1/4" to form my Fold Back base. 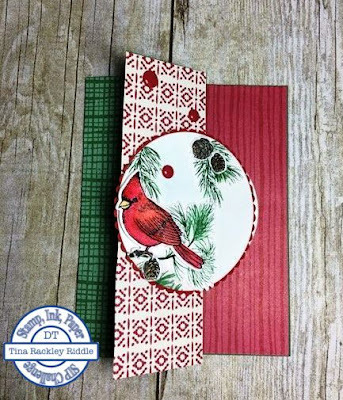 Then I cut layers of coordinating pieces of "This Christmas Designer Series Paper" from the annual Stampin' Up! Catalog. 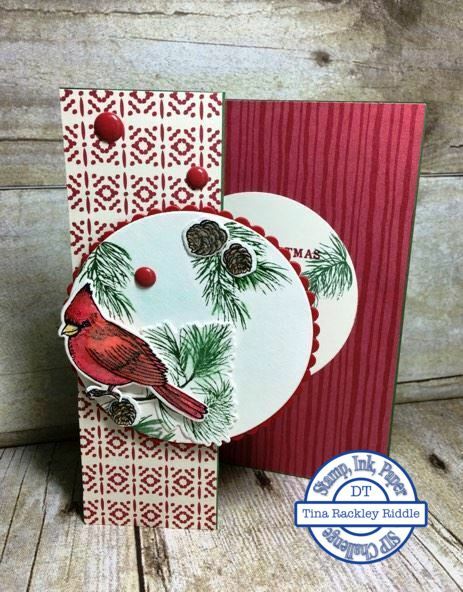 If you are a sucker for Cardinals, message Justin and get your hands on this awesome stamp set! Wonderful card. I love the chosen colours. Beautiful! Love the DSP you chose!